On Oct. 8, a magnitude-7.6 earthquake shook Kashmir, a region split by Pakistan and India. Most of the damage took place in the Pakistan-governed portion of the region, amplified by a multitude of landslides large and small that cascaded down the steep mountainsides of the Himalaya. One such landslide, pictured in this issue (Print Exclusive), brought down a hillside above the Neelum River, north of the Pakistani regions capital of Muzaffarabad. The dolomite and limestone, sedimentary rocks from the Muzaffarabad Formation, were laid down during the Precambrian (590 million years ago), according to Ahmad Hussain of the Geological Survey of Pakistan. Lieutenant Colonel Wiley C. Thompson, a graduate student in geosciences at Oregon State University who is currently serving in Afghanistan, took this photo on Oct. 28, while participating in American relief operations in Kashmir. After the earthquake, relief to the region slowly trickled in, hampered by destroyed roads, weather, and political disputes over where, how and when rescuers could go  as well as by a small international response in comparison to the philanthropic outpouring to the tsunami-devastated Indian Ocean countries, after the December 2004 earthquake in Sumatra. At the end of November, the United Nations estimated its relief efforts were short by about half of the funding necessary to help more than 400,000 people who remained reliant on relief aid as winter conditions closed in above elevations of 1,500 meters (about 5,000 feet). In addition to landslides throughout the region, Muzaffarabad and the surrounding towns and villages suffered devastating shaking that collapsed houses and apartment buildings as if they were toy structures, causing them to pancake and crumble (see Geotimes, December 2005). More than 73,000 people died in the immediate aftermath. For initial coverage of the Kashmir earthquake, visit the Geotimes Web Extra archive. The largest free-floating object in the world just became a little smaller. Iceberg B-15A, the last vestige of its parent B-15 iceberg that calved from the Ross Ice Shelf in March 2000, seemed to have run aground off Cape Adare, located in McMurdo Sound in Antarctica, in mid-October. The 2,500-square-kilometer (965-square-mile) iceberg is now three large pieces  B-15M, B-15N and B-15P  and a smattering of smaller splinters. 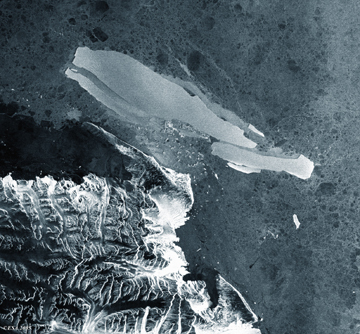 The image here shows the breakup in progress on Oct. 30, snapped by the European Space Agencys Envisat satellite, using Advanced Synthetic Aperture Radar that can see ice. The radar looks past clouds to the surfaces below (see Geotimes, November 2003), and its sensitivity to surface textures allows it to distinguish between new ice and old, and even snow cover. (Icebergs are rougher than regular sea ice.) Scientists started tracking the former B-15A iceberg when it started drifting about a year ago. For a while, ice buildup from the glacier blocked local penguins from access to food, decimating their populations.